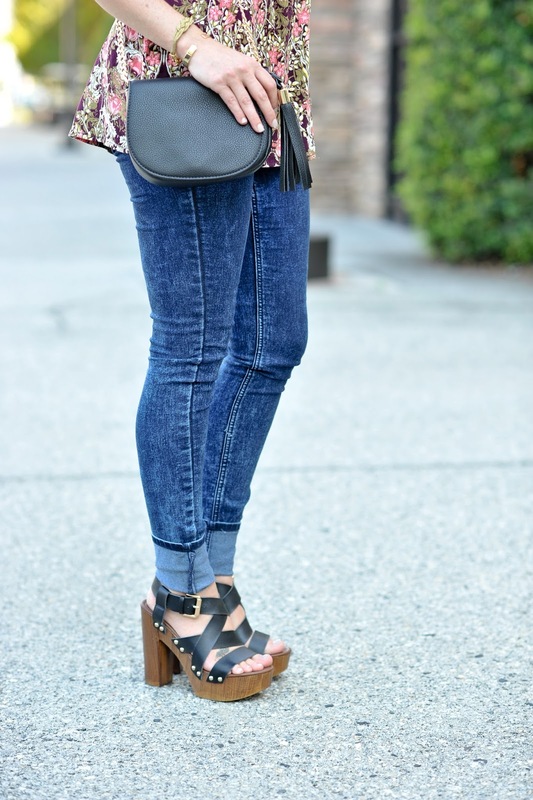 Today I’m showing you the prettiest fall floral print with this simple cami. So with Fall vibes in mind I’ve already started transitioning into my fall wardrobe with darker jewel tones. This adorable tunic-style floral print cami is so lightweight and airy and the plum and sage tones are perfect for fall. Once the weather gets a bit cooler you could even layer a nice cardigan or long-sleeve utility blouse on top! Let’s also talk about this choker trend! I’m seriously always like a year late when it comes to trending pieces so I’m really surprised that I was digging the chokers so soon! At first I really did NOT want to relive my middle/high-school years (aka the 90’s) but I don’t know what changed…..I just really love them now! Chokers are simple and can be dressed up or down for a daytime or evening look. You can also layer them with other necklaces as well! This choker was from Nordstrom (BP) and only $15! With this particular blouse I felt like I needed a longer gold necklace to layer with the black choker ……but I forgot to put one on! Everything in this look was super affordable with each piece being under $30! Designer is always nice when you can afford it but you don’t need to break the bank for a beautiful look! Hope you all enjoy the holiday weekend! Stay Tuned for another gorgeous affordable fall look next week! 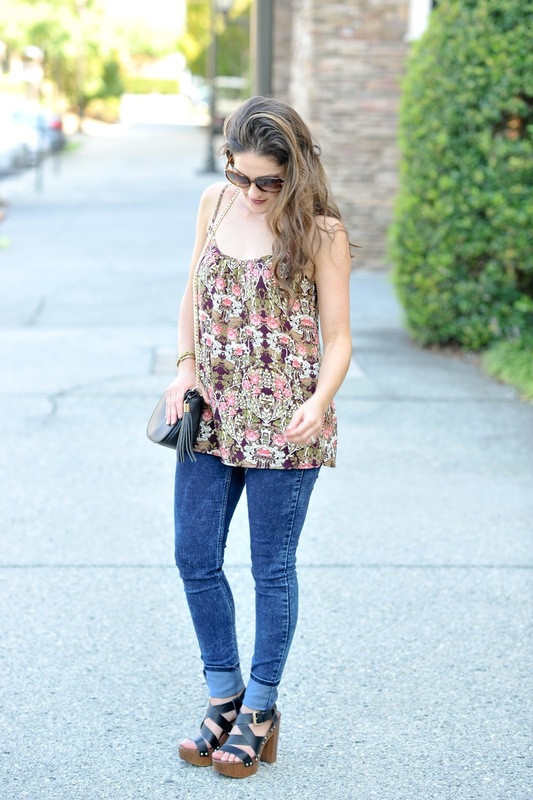 The ease of this floral top is amazing! Love the choker too!! I need to get on the choker trend too, Erica. I would love a simple black one like yours. Also those sandals and sunnies are awesome. With the dark florals of that camisole, you are ready for Fall, Erica. =) Looking beautiful as usual. I just bought a choker last week!! Love this look, you are gorgeous! I'm loving the choker trend and also those shoes! So sassy!